A quick recap to start: I have thus far argued that the Bible does not give us much direction for the specifics of musical worship, instead giving us the theological principles around which we must construct specific application. The guiding theological principle that the Bible gives to this end is that all of life is worship. Therefore musical worship should aim to encourage a more worshipful life. The NT consistently refers to almost all congregational activity through this paradigm. Whereas I defended that assertion with a few texts in my last post, my purpose here is to show the way that the Bible bears this out over the course of salvation-history. For this task I am almost entirely indebted to D. A. Carson's article entitled, "Worship under the Word" in the book he edited entitled Worship by the Book (which I cannot recommend any higher). This is a large task, so I hope you will excuse the length of this post. One of the of the key differences between the Old and New Testaments is the locality of God. Of course, God has always been omnipresent, but God's corporate election of Israel is marked by His unique presence with that people. This is why the Exodus, the definitive event in God calling out a nation for himself (not just a person and his future descendants, but those descendants as a nation), culminates at Mt. Sinai. The first half of the Book of Exodus is Yahweh's self-revelation in the action-packed deliverance of His people. But suddenly, right around Ex. 19, the narrative slows down. Israel is no longer on the run- they are at the foot of Sinai, interacting with a God who they do not dare come near. Yahweh responds by teaching His people what it means to worship Him. This starts with the Ten Commandments and other Laws to govern daily obedience in relationship with Yahweh (Ex. 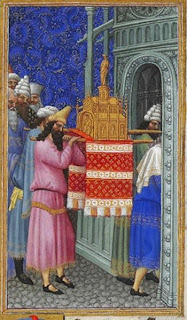 20-24), but continues with detailed instructions for the ark of the covenant, the tabernacle, and the congregational worship that will characterize Israelite life with His unique presence (Ex. 25-32, 35-40). This aspect of Yahweh's relationship with Israel continued throughout the generations leading up to Christ, including the grander display seen in the temple, where again God's presence uniquely dwelt with His people. Congregational worship in Israel therefore included meeting with God in a central location because God Himself was uniquely present in a central location. Thus Carson rightly says, "Worship was powerfully tied to cultus." (Carson, "Worship Under the Word," 35) The life of the cultus, including the ark (and later the temple), the priests, the sacrifices, and so on represented an enormous part of human interaction with God. Of course, this needs some balance: personal worship mattered so much in OT Israel that God could say that He hated the sacrifices and festivals that He Himself had instituted (Isa. 1:11-14, et. al.). But this also should not be taken to mean that the cultus was unimportant. God's very presence in the midst of His people defined corporate worship. Which is why it is so striking that the NT redefines almost all of those symbols. No more is there an ark or a temple: Christ is the temple (Jn. 2:13-22). No more is there a tribe of Levitical priests: Christ is the Great High Priest (Heb. 6:14-16) and all believers are priests (1 Pet. 2:5). Sacrifices are lives of worship (Rom. 12:1-2). And so on. Christ's work on our behalf forces these changes and defines NT worship. In this sense, my "one theological principle" that guides our theology of worship is really just the gospel- in particular, Christ's work as the mediator of God's presence to all people everywhere. So Jeremiah's prophecy of the new covenant (Jer. 31:31-34) is inaugurated in Jesus, drawing on that same language from Ex. 29 (and originally in God's covenant to Abraham in Gen. 17:8): God will be our God, and we will be His people. Except that there is no central location anymore. Thus Jesus encouraged not worship on a mountain, but worship in spirit and truth (Jn. 4:23) and told his disciples that it was better for him to leave them so that he could send the Holy Spirit, who is not limited to one place (Jn. 16:7). Musical worship now thus in all aspects should be aimed at encouraging in one another the life worship that is the sacrifice of the new covenant. Life-worship was always important, but the "transmutation" (as Carson puts it) of cultus language is a conspicuous indication that in the new covenant it is the paradigm for all Christian activity- most certainly including what we do when we come together. All of life is sacred in a new way as we eagerly expect when it will be such in the newest way. Musical worship, like all of life, should reinforce that one aim: to please God with all of life. Now, how do we go about carrying that out when all of this theological rubber hits the musical road on Sunday mornings? My final post in this series will offer some suggestions. "Christ's work on our behalf forces these changes and defines NT worship. In this sense, my "one theological principle" that guides our theology of worship is really just the gospel- in particular, Christ's work as the mediator of God's presence to all people everywhere." How God has been challenging me is how then to bring this Gospel-centered life-worship to "all people everywhere;" in other words, what implications this theology of worship has on God's commission for us to share His love with our neighbors.